Hello from little ole England, U.K.! ... Although I'm not a proficient bones player I'd love to show off my dad's matchstick bones and the other pair he made from used wooden matchboxes... logos an all. I have attached a jpeg photo I took with my son's digital camera of the matchstick bones, with two other matchstick percussion instruments. Not the best image, but I hope it gives an indication that they can be played in the normal way. Nothing flimsy about them. My dad made them in 1970 and played them on and off until he passed away in 1993. If anyone wants to see the wooden matchbox bones, let me know and I'll see if I can take some reasonable shots. Here's some detail about the matchstick bones: 1,000 used wooden matchsticks stuck together with hide glue. Whittled into shape with a knife, a file and a straight edge razor. Finishing touches with sandpaper and clear varnish. Is this called lacquer in the U.S.? on one side the matches are headless and glued cross-wise. The other side, the matches are glued length-wise with the blackened, burnt match-heads ingeniously interlocked to form soldier patterns. You can also see how the bones have aged to a golden color over the last 35 years. When my dad first made them they were the same colour as the scattered matchsticks laying around. Lastly, the matchstick bones are listed in the book of Guinness World Records, 2003 Edition. 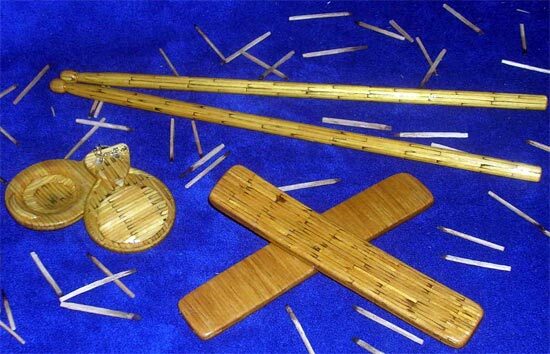 The abbreviated text in the book says: "Tony Hall (UK) owns 10 full-size playable musical instruments made entirely from 106,000 used wooden matchsticks."